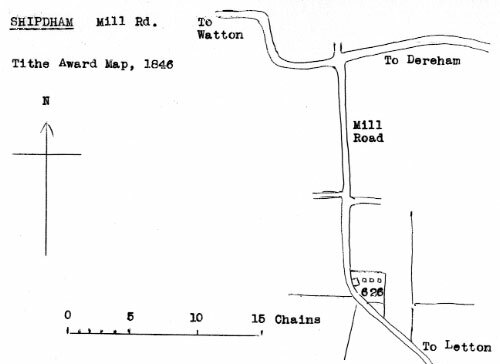 Shipdham Mill Road mill stood on the southeast side of the village. The mill used patent sails to power 2 pairs of stones. Lot 1. 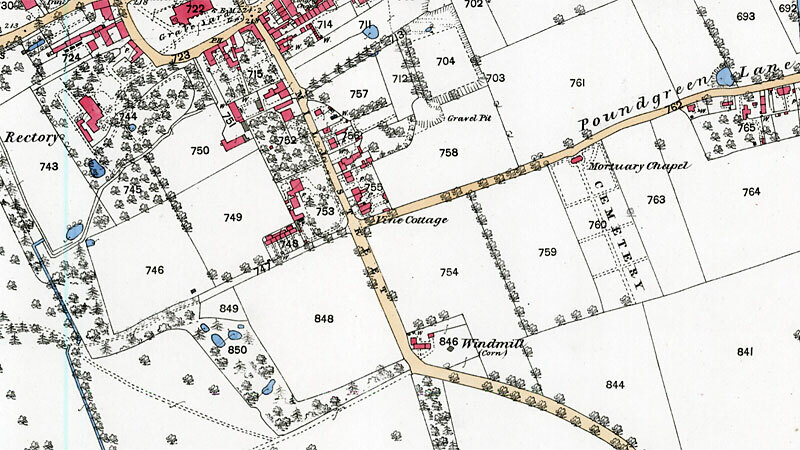 A Freehold Messuage & STOCK WINDMILL with Garden and Croft thereto adjoining and belonging situate at Shipdham aforesaid as now in the occupation of William Hodge, Miller containing in the whole 2 roods. Apply to Messrs. I. O. Taylor & Son, Norwich, Fred Lees, Nottingham or to the tenants who will show you the property. To be Sold by Auction by J. H. Greenacre at the Dog Inn, Shipdham on Thursday 21 March instant at 5 o'c. The above Premises are all Freehold and Possession may be had at Old Michalemas next. Particulars of Messrs. Cooper & Sons or the Auctioneer, East Dereham or Mr. I. O. Taylor, Solr. Norwich. WANTED, a Young Man to work a Post Wind Mill. One accustomed to the Grist Trade preferred. Apply W. Hodge, Shipdham, Norfolk. Wall anchors on the derelict Mill House were removed as the house was renovated in 1971. These were marked I.C. - John Clements.